Congratulations to Cabarrus County School's Teacher of the Year! Courtesy of Rocky River Elementary School's website. 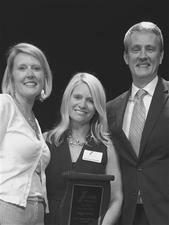 Recently, Paige Norris was named the CCS Teacher of the Year. Paige Norris is a kindergarten teacher at Rocky River Elementary School. This was announced May 2nd, 2017 at an event held at Cabarrus Arts Council's The Davis. After starting as a teacher in 2006 with CCS, initially facilitating children in the oral deaf program, she landed her dream job as a kindergarten teacher in 2011. Norris has always loved working with children and was so inspired and thankful to work with kindergarten students. Norris was recognized for her love of children, her devotion to her students, and her relentless work ethic. She also mentors students at her alma mater the University of North Carolina at Charlotte (UNCC), among many other things within the community. Congratulations, Paige! We are so thankful to have you in our community!